The low budget Digiforce 9310. 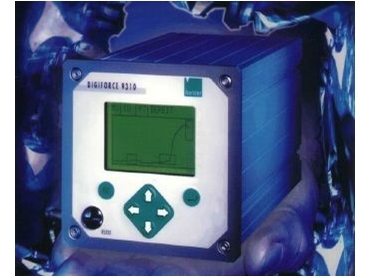 THE proven press fit controller Digiforce 9306 from burster, represented in Australia by ACM Laboratory , has offspring. The "little-one" is meant to serve mainly those application fields where, so far, a seamless force/displacement control is out of question for pricing reasons. Up to now those applications often run with much more simple systems evaluating the press fit quality by measuring only the maximum force arising. This method inevitably leads to deceptive measuring results. The new Digiforce 9310 from burster enables more reliable test results in the low budget scene. Digiforce 9310 acquires - like its big brother - the complete press fit curve on two measuring channels, shows it on a rich, in contrast, graphic display, and evaluates it via the Digiforce window technique. As a panel meter for the 110 x 110 mm panel cutout or as desktop version Digiforce 9310 fits for all manual working stations. Further, it serves to equip multi-channel control applications with a considerably economic solution as, for example, on the parallel press fit of valve seats in motor production.